This Nordlys Ellipse IPL laser effectively treats a wide variety of skin conditions, including unsightly acne scars, by using a combination of fractional and infrared lasers in one device that can cover both small and large areas of the body. Birmingham AMAE Med Spa is one of the few facilities in Oakland County to offer this fast, comfortable, affordable, high-tech laser skin care treatment. In this article we discuss how the Nordlys Ellipse IPL laser removes acne scars. Acne occurs when the oily secretion of the sebaceous glands (sebum) is unable to leave the skin because a hair follicle is blocked. As a result, bacteria grows beneath the surface of the skin, causing ugly pimples. Rupture of an inflamed area can then lead to permanent scarring. If you have acne scars it can cause you to feel less confident or attractive. In teens, unfortunately, acne scars can even lead to teasing and bullying. The Good news is that the latest technologies in laser treatments can rapidly, painlessly and affordably reduce and remove acne scarring. Scars are the result of the body’s natural wound healing process that repairs the skin. Scars are comprised of fibrous tissue that has replaced the regular skin after an injury. Both scar tissue and the normal tissue that it replaces are made of collagen. However, in normal tissue the collagen fibres are placed in a random formation, but in scar tissue the fibres in the scar are cross-linked. 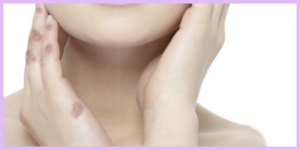 The type of acne scar that develops depends on the the depth of the wound, its location, and other variables. 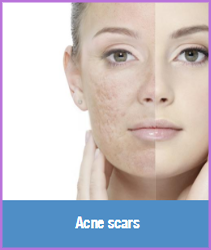 Acne scars are sometimes described as ice-pick (pitting), rolling or box scars. Initially acne scars are reddish in color, but over time they become colorless – looking almost white against our normal skin pigment. For red (new) scars the Ellipse Selective Waveband IPL Laser works by directing controlled pulses of specific light frequencies into the upper skin layer. The light is absorbed by red hemoglobin in the blood that is in the blood vessels in the scars. The light energy is then transformed into heat, which damages the walls of the micro-blood vessels. The light produced by the Ellipse systems is carefully controlled to produce the correct wavelengths and pulse lengths to destroy the targeted acne scar tissue blood vessels without damaging surrounding skin. However, for colourless older scars, the Frax 1550, non-ablative fractional laser, is a better alternative. This because there is a lack of hemoglobin in the old acne scar for the IPl laser to target. Many patients with acne scarring will benefit the most from a combination treatment of the Ellipse SWT® laser and the non-ablative fractional Frax 1500 treatment. Birmingham double board certified plastic surgeon Dr. Ali offers the absolute best, state-of-the-art technologies in skin treatments, including acne scar removal and wrinkle and line reduction. In addition to Nordlys Ellipse IPL laser skin treatments, we also offer Fraxel 1550 laser treatments as well as ThermiSmooth radio frequency skin treatments. Each laser skin treatment begins with a thorough and caring professional skin consultation. Treatments are selected and optimized to meet the specific needs of each client with the most innovative and comprehensive products and technologies. For optimal results we offer custom packages of laser treatments, under the guidance of board certified plastic surgeon Dr. Ali and medical aesthetician Ramona. Schedule a laser acne scar removal treatment – and then relax in our Birmingham Med Spa, while we make you look and feel more confident and attractive!